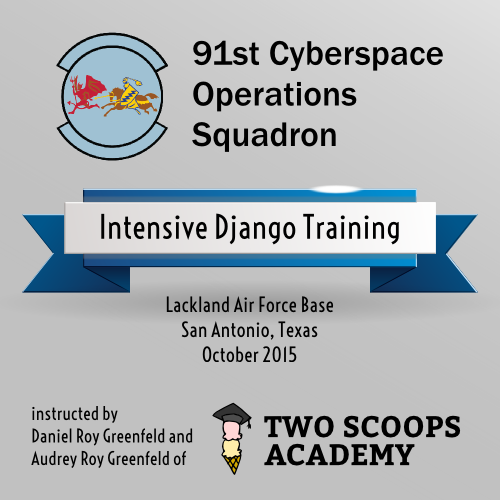 Daniel and I just returned from a trip to San Antonio, Texas, where we taught one of our intensive Django training workshops at Lackland Air Force Base. We prepared a customized version of our curriculum to meet the needs of the 91st Cyberspace Operations Squadron of the US Air Force. Teaching such a sharp, enthusiastic group and seeing everyone grasp difficult concepts so rapidly was a huge thrill. As instructors who like challenges, we tend to err on the side of assuming that our students can handle anything, so we threw a lot of very advanced topics at the group, wondering how much would click. On the last day as they were putting their knowledge into practice during hands-on project time, it was apparent that even the hardest parts had made an imprint. For more info, see Intensive Django Training with the US Air Force, Daniel's detailed blog post about the training experience. Special thanks to Capt. Jonathan D. Miller for making this possible. It was an honor to work with you and your team.